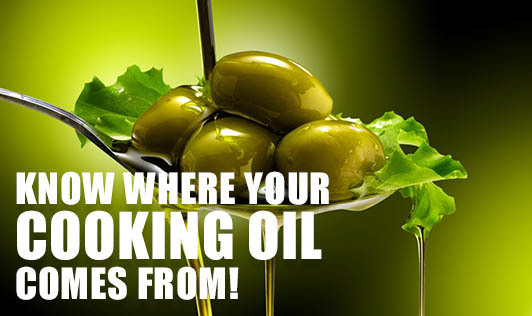 Know Where your Cooking Oil Comes From! Which oil do you use for cooking? When I ask this question to my clients, as an answer I get a name of a brand! Groundnut oil: Mild flavoured, used for frying, salad dressings, cooking, and preparing margarine. Has a high smoking point, is high in MuFA, and so is considered to be a healthy option! Sunflower oil: Extracted from sunflower seeds, it is bland in flavour, pale yellow in colour and is known as an all purpose cooking oil. This also is high in MuFA and so is healthy! Soya bean oil: It is produced as a by-product of soy meal, but is very high in omega 6 fatty acids. Mildly flavoured, it is a versatile oil (can be used as an all purpose oil). It is also commonly used in cakes and pastries. Safflower oil: A flavourless all purpose cooking oil, high in omega 6 fatty acids. It is commonly used as a salad dressing, as it does not solidify on freezing. Mustard oil: Packed with omega 3 fatty acids, it is highly beneficial for health. It has a clean flavour and is very palatable contrary to some beliefs. It is used for cooking and frying. Rice Bran oil: This oil is highly suitable for high temperature cooking, it is known to be very stable. It is also rich in antioxidants, making it one of the healthiest oils for consuming. Olive oil: It is a very good source of MuFA and has many health benefits. It is typically used in salad dressings, apart from cooking, sautéing and frying. Coconut oil: Coconut oil is mainly used in the regions where it is cultivated. Commercially, it is used in bakery products, whipped toppings, shortenings etc. The type of fat it contains is majorly saturated. Next time you buy a cooking oil, make sure you know it's source!